Dating the boss has its advantages. A guaranteed backstage pass is just one of them! Synopsis: Ashton Wright is the quintessential artist with a tortured past. Singer-songwriter and entrancing frontman for the legendary indie band the Stick Shift Lips, he is the epitome of a rock star. He’s gorgeous, talented and his fans love him. The trouble is, his sordid past continues to haunt him to the point where he’s become reclusive and withdrawn. He no longer seeks the limelight and the self-destructive guilt that he carries within himself is making him question whether or not he wants to leave the band for good. Out of sheer loneliness and despair, he takes out an ad for a personal assistant. The last thing Ashton expected was to find love and redemption in the form of Chloe Martin, a timid and shy art school graduate, stuck in a directionless dead end job. When in a twist of fate, Chloe discovers Ashton’s ad in a local cafe and he instantly offers her the position, they find themselves at a crossroad. 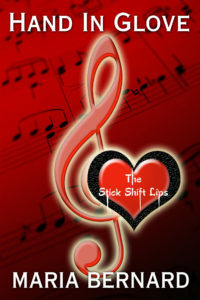 The Stick Shift Lips are my absolute favorite fictional band – This is the first book in the Stick Shift Lips series and, I’ve got to say, The Stick Shift Lips are my absolute favorite fictional band. I fell in love these characters! After reading Hand In Glove, I devoured the rest of the books one right after the other. And they just kept getting better the more I got to know all the other characters in the band. Stick Shift Lips….WHAT!!!!! Love it. – This is the second book I’ve read by Maria Bernard, I love her stories. Hand in Glove introduces use to the band Stick Shift Lips and it’s members singer/songwriter Ashton Wright, brothers guitar player/songwriter Nick and bass player Chris Arrow and drummer Jamie Gale. Hand in Glove gives us the story of Ashton and Chloe. Right from the beginning I loved Chloe, she sweet, sensitive, loving with a hint of fire. She’s looking for her place in life but unsure how to achieve it and takes a chance on an ad she sees. Ashton had me loving him and shaking my head at times. It was great to see how his character started to come out of his shelf induced darkness he exiled himself to with the help of Chloe. The story didn’t just keep to the main characters at all times, it keep us happily fed with the other band members as well letting us slowly see their personalities. The story is a great read I recommend it, you be hooked.